Moustaches are now curled and corsets gone — at last! A schoolboy fires a shot to usher in the Somme. S.H. Two bloody events cast their respective shadows over the twentieth and twenty-first centuries : the assassination of Archduke Franz Ferdinand in Sarajevo on June 28 1914 and the Two Towers Attack of 9/11. Both events had ‘extreme impact’. The first was followed within four months by the outbreak of war on a scale never seen before in Europe (since in the past wars had been largely the affair of professionals) and the German defeat led on to the rise of Nazism and World War II. As to the Two Towers, it led, equally rapidly, to the invasion of two Middle Eastern Moslem countries, Afghanistan and Iraq, also to massive expenditure by America which worsened its already shaky finances. I propose to examine these two events from the standpoint of the principles of Eventrics, such as they are. It would be tedious to record in detail the diplomatic manoeuvring of the great powers during the run up to WWI and the interested reader is referred to the first chapter of Liddell Hart’s History of the First World War or to one of A.J.P. Taylor’s several books on the subject. Broadly speaking the situation was this : the ‘balance of power’ in Europe had, during the latter nineteenth century, been disturbed by the coming of age of two really big players, Germany and Russia, countries that had, in the previous centuries, either not existed as an entity at all (Germany) or been considered as an irrelevant anachronism (Russia). But now Germany was rapidly overhauling Britain as the leading European industrial power and even threatening her naval supremacy, whilst Russia, because of her huge manpower, natural resources and belligerent foreign policy posed a perpetual threat to British and French colonial interests in the Middle and Far East. Maybe the great ‘old’ European powers, France, Britain and Austria, had had their day and must give way to new ones, in much the same way as America and Europe are ceding ground to China and other ‘Tiger’ economies of the East. In Eastern Europe, Austria and Russia each strove to profit from the slow disintegration of the Turkish Ottoman Empire. ‘Yugoslavia’ did not yet exist : the Balkans were a patchwork of independent or semi-dependent states aligned either with Austria or with Russia. Austria-Hungary had annexed Bosnia-Herzegovina in 1908 which angered ethnic Slavs and Serbs who would have preferred joining up with neighbouring Serbia, an independent state with strong ties to Russia. On June 28 1914, the anniversary of his wedding, the heir to the Austrian throne, Archduke Franz Ferdinand, was due to make a routine state visit to Bosnia to inspect the army. By all accounts the underground nationalist organisation, the Serbian Black Hand, sort of IRA of the time, was behind the Sarajevo assassination attempt though it was actually carried out by six young volunteers, very much the sort of people who now become ‘suicide bombers’ in the Middle East. What is remarkable about the assassination (apart its unexpected world-wide consequences) is the way a series of ‘coincidences’ led, first of all to the total failure of the assassination, and, almost as an afterthought, to its equally unexpected success. The record of events reads more like the plot of a Peter Sellers comedy than a tragic drama. To start with, once the Archduke and his wife had arrived at Sarajevo Railway Station, special security officers who were supposed to accompany their chief and take their place in the first car of the cavalcade somehow got “left behind” (Wikipedia). The six conspirators had been posted at intervals along the pre-arranged route which led from the railway station to the barracks and from there to the Town Hall. The first two conspirators, both armed with bombs, did nothing, either because they lost their nerve or because of the unanticipated presence of the Archduke’s wife, Sophie, alongside him in the third car of the cavalcade. Further along the route, at 10.10 a.m., Čabrinović threw his bomb but it bounced off the cover of the convertible into the street, wounding twenty bystanders but without even drawing blood from the Archduke. Čabrinović, provided in advance with a suicide pill, bit into it and, for good measure, threw himself into the Miljacka river nearby. However, the cyanide only induced vomiting and he didn’t drown either because there was hardly any water in the river – Wikipedia says it was “only five inches deep” ! The procession continued onwards to the Town Hall passing the last three conspirators who all, including Gavrilo Princip, failed to act. The assassination attempt had thus proved to be a complete fiasco, rather like the Islamist terrorist attempt at Glasgow Airport three or four years ago. The Archduke, somewhat rattled but otherwise none the worse for wear, made a short speech at the Town Hall thanking the people for their support and evident joy that the plot had failed. The Archduke and Sophie cancelled the normal itinerary in order to visit the wounded at Sarajevo Hospital and once again got into the same convertible. Potiorek, the Governor of Sarajevo, ordered the cavalcade to travel to the hospital via the Appel Quay, the route the cavalcade had followed earlier in the day, but seemingly ‘forgot’ (!!!) to inform the driver of the third car of this change of plan. Halfway there, the driver of the car containing the Archduke and his wife turned into Franz Joseph Street, quickly realised that he had lost the other cars and reversed. His engine stalled. Princip who still had his pistol in his rucksack, happened by some extraordinary chance to be at that very spot; he rushed forward knocking a bystander out of the way and fired two shots from virtually point-blank range. 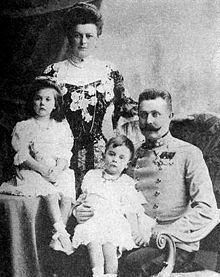 The Archduke and his wife died from their wounds within the hour at Sarajevo Hospital. As for Princip, nineteen years old at the time, he was arrested, tried and sent to prison but could not be executed because of his age. He subsequently confessed that he had not wished to kill the Archduke’s wife. The assassination, though unusual because of the high rank of the victim, would have soon been forgotten had it not led, in an incredibly short space of time (three months), to declarations of war between the major European powers. The event is thus not so much remarkable in itself as remarkable because of its unintended consequences : the nebulous aim of the conspirators was certainly not to provoke a world war but merely to warn Austria to stop interfering in the affairs of the Balkan states. Taleb mentions this event as an example of the ‘imponderables’ of history but it is not clear that it really qualifies as a ‘Black Swan’ event because it was deliberately planned. 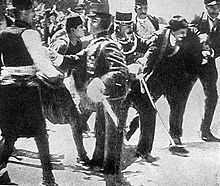 The assassination of Archduke Ferdinand had ‘extreme impact’ and was a (relatively) rare event but was not a random event in any sense of the word. It is the consequences that were unforeseen and arguably unforeseeable, not the event itself. But wasn’t a general European war inevitable anyway ? Marxist theory predicted a large scale conflict between the great capitalist powers looming up but Lenin was actually caught out by the outbreak of hostilities and was flabbergasted that the German Social Democratic Party voted war credits to the government. Historians are always ready with reasons after the event but nobody at the time seems to have explected war just then and A.J.P. Taylor argues that German industrialists in particular did not welcome war since they “were convinced, with good reason, that Germany would soon become the leading Power in Europe from sheer economic strength” (Note 1). The four great powers, Britain, France, Germany and Russia had been eying each other warily for the last twenty odd years and several incidents had brought the countries to the brink. Britain and France pursued a tortuous diplomatic path, unsure which was the greater threat, Germany or Russia. Indeed, the twentieth century could easily have gone the other way : instead of Germany fighting the other big European powers more or less single-handedly, a second possibility was everyone ganging up on Russia to stop its remorseless expansion westwards (Note 2). It is as if the dramatist of twentieth century history put in a subplot and for some time the audience was deliberately left in the dark as to which was the main plot and which the subplot. Britain’s alliance with Russia, Tsarist or Soviet, was never anything but reluctant and, during the Thirties, a considerable section of the British public thought that Hitler had his uses as a bulwark against Communism. And, as it happens, the subplot just didn’t want to go away since during the latter part of the twentieth century there actually was an alliance of the big European countries including (West) Germany against Russia and this alliance did result in a ‘war’ of sorts, the ‘Cold’ variety. Interestingly, a computer programme devised by Axelrod and Bennett using concepts such as the tendency of physical systems to seek out ‘potential minima’ has been applied to alliance formation in Twentieth century Europe. According to the programme, the two most likely scenarios are (or rather were) : all the big West European powers except Italy on one side and Germany and one or two smaller states on the other, or the whole of Europe except for Yugoslavia and Greece against Russia standing virtually alone (Note 3). The first scenario was the plot, the second the subplot. It is now becoming fashionable for scientists to profess disbelief in free will and thus in personal responsibility — though if I actually knocked one of them down in the street he would be outraged and take me to court rather than view me as a victim of my genes or social circumstances. I personally take the commonsensical view that, although there are all sorts of contributing factors that influence human behaviour, nonetheless there is such a thing as free will. I don’t think the assassination at Sarajevo was inevitable simply because it happened, and, more specifically, don’t think that it necessarily had to lead on to world war just because it did. On the other hand, I certainly don’t think that ‘anything can happen any time’. In a particular historical situation there exist definite large-scale trends, not unlike Stock Market movements, but whether one particular trend leads to a specific outcome depends firstly on whether the political system is in a ‘critical state’ and, secondly, whether an unexpected stray event sets things off (or has the reverse effect of damping things down). This is more or less in line with contemporary thinking which increasingly stresses the importance of the dynamic interaction of a multitude of elements which can end up by pushing the system into a qualitatively different state. However, I am prepared to go rather further down the line than most rationalist/scientists would wish to go, terrified as they are of anything that smacks of elan vital or occult forces (as they see it). I believe that events and the forces that develop between events are the driving forces of history : human beings are in the curious position of being at one and the same time subject to the exact selfsame forces as everything else but simultaneously capable, within circumscribed limits, of deciding which trend to follow or whether to retire from the action (Note 4). So what exactly is going on in the Sarajevo assassination in terms of the youthful science of Eventrics (the study of event chains and their interactions)? We have an explosive event environment, Europe’s economic and political condition at the beginning of the twentieth century, but this has no direct bearing on the train of events in question, the ‘Sarajevo assassination’ event-chain, only on its unexpected consequences. Curiously, the event that set Europe ablaze took place on the sidelines, in a “forgotten state whose name few people knew” and yet not far enough away to be insulated from the volatile European event- environment. The ‘assassination’ event-sequence gathers momentum, and several ‘coincidental’ circumstances strengthen it. The ringleader of the plot was a certain Ilic but he did not participate in the actual assassination. Three of the conspirators were Bosnian Serbs from Belgrade and they had to cross the frontier to enter Bosnia. The father of one of the three, Čabrinović, had been a Sarajevo police official and on the train to Sarajevo Čabrinović bumped into one of his father’s friends, Sarajevo Police Detective Ivan Vila, and struck up a conversation. Čabrinović learned from Vila the date of Franz Ferdinand’s visit to Sarajevo and passed the news on to the others. It has been suggested that Potiorek, the Governor of Sarajevo, was complicit in the assassination attempt and certainly the security arrangements were very lax, but this is probably going too far though his strange behaviour suggests that he suspected something was going on. At this point a contrary event-chain comes into operation. The first two conspirators do not act, perhaps because of the unexpected presence of a woman in the targeted car. Then there is the ludicrous incident of Čabrinovic’s bomb getting deflected and the failure of his attempted suicide (by two different methods). Finally, the last two potential assassins do not act either : maybe they got wind of the failure of Čabrinovic or something in the general atmosphere unnerved them. The anti-assassination event-chain thus seems to have completely knocked out the first, so much so that the Archduke speaks of the ‘failed’ assassination plot just an hour or so before his actual death. Even though the action was planned, its eventual success was the result of chance, of the highly unlikely convergence of at least three separate events : the driver of the car taking a wrong turning, the engine stalling at this precise moment and Princip’s fortuitous presence at exactly the right spot. Not only this, the attempt was much more likely to be successful in this case since Princip was able to approach the car without being challenged and was able to fire from a distance of five feet whereas, earlier on, the cavalcade passed at high speed. The chances were that a bomb thrown in the crowded street or a shot fired from the middle of a jostling throng of people would only have wounded the Archduke anyway, whereas, because of the fateful wrong turning, Princip was able to approach the statonary car and fire from close range, killing the Archduke with a single shot. The assassination event-chain thus ‘won out’ but in a very strange way : it actually turned to advantage the initial failure of the plot since no one was expecting a further attempt and, if the Duke had not departed from his initial itinerary, he would never have been right in front of Princip in a less crowded street. Those who believe in fate might conclude that this assassination ‘had to be’ and nothing at all could have prevented it. I do not go so far as this, but I do see a certain interplay of event-chains that strikes me as being more than fortuitous. Of course, event-chains do not ‘know what they are doing’ when they are opposing each other in this way, but then neither do viruses and bacteria ‘know what they are doing’ when they struggle for supremacy. So what is my conclusion — if not fate, then just bad luck ? I believe that events go through several stages before becoming actual, as it were : the various possibilities ultimately narrow down to just one or two and a random interaction with a stray event can decide which event-chain is finally materialised (Note 5). The parallel in physics is a system which is in a state of unstable equilibrium. A needle balanced on a straw is likely to be toppled over at the slightest motion of the table and which way it falls depends on the disturbance. A marble in a hollow may be temporarily pushed up one side of an incline for one reason or another but will roll back down again. This ‘Event Rehearsal’ theory could be used to explain certain alleged cases of precognition : it is not the actual event in the future that is seen but its approximate materialisation which is why even relatively successful ‘prophets’ get some details wrong. It strikes me as ridiculous that scientists and rationalists prefer completely fantastic theories like the Many Worlds Interpretation (whereby all possibilities become actual in some world) rather than this relatively straightforward theory. Note that in the Event Rehearsal Theory there is a progressive actualization of events. In Quantum Mechanics we have two stages only : a system left to itself consists of an infinity of possible events with differing probabilities whereas once another system (such as ourselves) interferes with it, the wave ‘collapses’ into a single unambiguous event. The problem, of course, with the Rehearsal Theory is determining where exactly all this ‘progressive actualization’ takes place but a similar problem exists for those, fairly numerous, persons who say they believe that the whole universe is a sort of vast computer carrying out simulations. S.H. (3) See Critical Mass by Philip Ball, pp. 354-361. Of course, the computer simulation got one or two details wrong — but it would frankly have been suspicious if it turned up exactly the right results. For example, Portugal is an ally of Germany in Scenario 1, and Poland is an ally of the anti-Russian Coalition in Scenario 2. In reality, Portugal and Spain, for ereasons of Realpolitik kept their distances from Hitler though preferring him to the French and British governments, and numerous volunteers from the Iberianm peninsula fought for the Reich. As for Poland, it was only because Hitler invaded first that the Poles ended up technically ‘on the same side’ as Russia (Stalin invaded Eastern Poland six weeks later). If anything, the Poles at the time feared and disliked the Russians more than the Germans — there is the sick joke about a Pole being asked whom, given the chance, he would kill first out of a German and a Russian. He replied, “The German, Business before Pleasure”. (4) Market analysts are always advising traders to ‘go with the market’, rather than fight it. Unless you have the clout of George Soros, the best strategy does indeed seem to be to ‘follow the trend’ rather than to seek to impose your own puny will on the market. In general, it is not possible to operate directly on large-scale historic events : it is rather by operating on the connections between established or imminent event trends that it is possible to acquire a certain ‘leverage’, but in the right context, this gives one a very significant advantage. Successful military and political leaders like Julius Caesar, Cromwell or Hitler were adept at ‘waiting upon events’ (the phrase is from Cromwell) and letting them do much of the work. (5) It is particular associations of ultimate events that become ‘progressively actual’ rather than the ultimate events themselves (the latter have ‘no time’ to go through various stages of realisation). As I see it, ephemeral associations of events, perhaps lasting just a few chronons, take place incessantly and it is only after a kind of natural selection process that certain associations of events become dominant. The whole process is endlessly repeated on an increased scale culminating in the very large patterns we call historical events. In Hinayana Buddhism one comes across the notion of different stages in the materialization of dharmas, some Indian authors going so far as to suggest that each dharma goes through as many as seventeen stages from original inception to complete realization.